One of the keys to a proper cuppa tea is getting the ratio of water to tea just right. 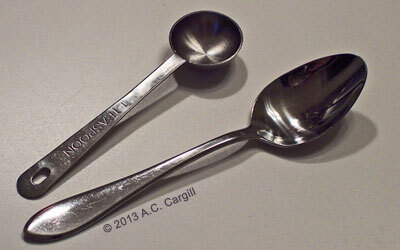 So, many tea vendors and tea advisors say to use a certain number of teaspoons full of tea per cup of water. There are several things to note here, so we are going to go through them in some kind of order. The range here is from full leaves to fine dust. The leaves can range in size from little buds (actually, two young leaves wrapped tightly around a third inner leaf so botanically speaking not a true bud) to leaves several inches long (usually, these are used to make oolongs) from further down the stem or from varietals of Camellia Sinensis that have larger leaves. The real issue is air. When you measure out a teaspoon of dry tea, the larger pieces will have more air in and around each piece than the smaller pieces. A fine Silver Needle tea will be composed entirely of the leaf buds as described above. A CTC Assam will be composed of little nuggets sort of like Grape Nuts. 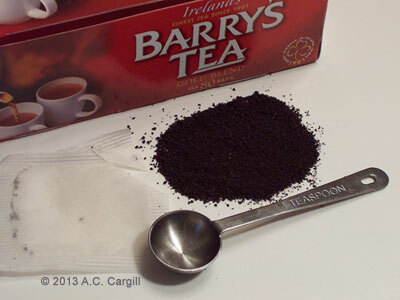 Many of the top brand bagged teas are ground to fine dust. Orthodox teas are usually larger pieces. Other teas are whole leaves that are processed and often are intact but shriveled. And then there are those pu-erh cakes — wet, partially processed tea leaves are pressed into cakes and then stored to age (ferment) for awhile (usually years). 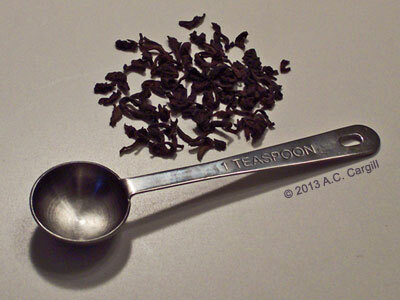 Measuring out a teaspoon of tea leaves can be pretty tricky here. So some vendors have been switching to specifying a certain weight (usually grams) to use per cup of water (or milliliters). 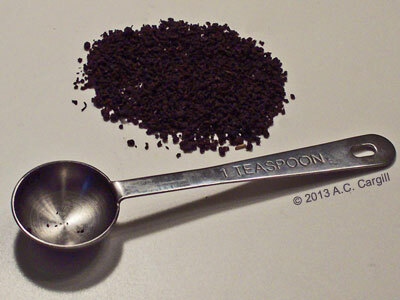 Some tea lovers have switched out that measuring spoon for a food scale. This is especially useful for pu-erhs, finer teas like Silver Needle, and those teas consisting of full leaves or large broken leaves (like lots of oolongs are). Whatever you use to get that amount right, the extra fuss will be worthwhile when you sip that perfectly steeped tea!